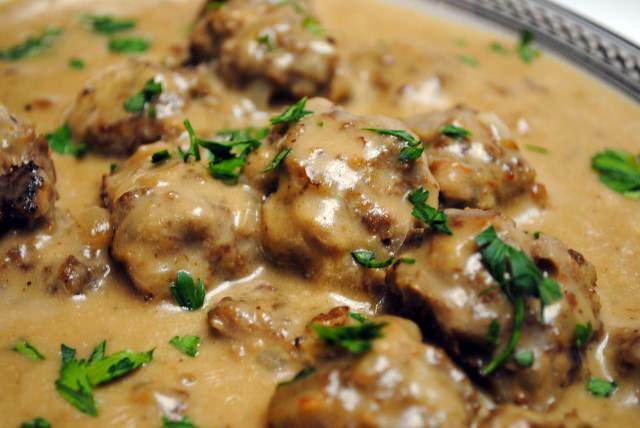 When hot, add the meatballs, season with salt and pepper to taste and brown well all over. Remove the meatballs and keep them warm. Tilt your skillet to the side to pool the remaining fat and butter. Whisk in the flour until you form a smooth paste. Add the stock and bring to a boil while stirring well. After a few minutes add the mustard, Worcester sauce and honey. Turn the heat down and add the cream. Mix well then add the meatballs to your gravy mixture. Top with parsley and serve with your choice of sides.